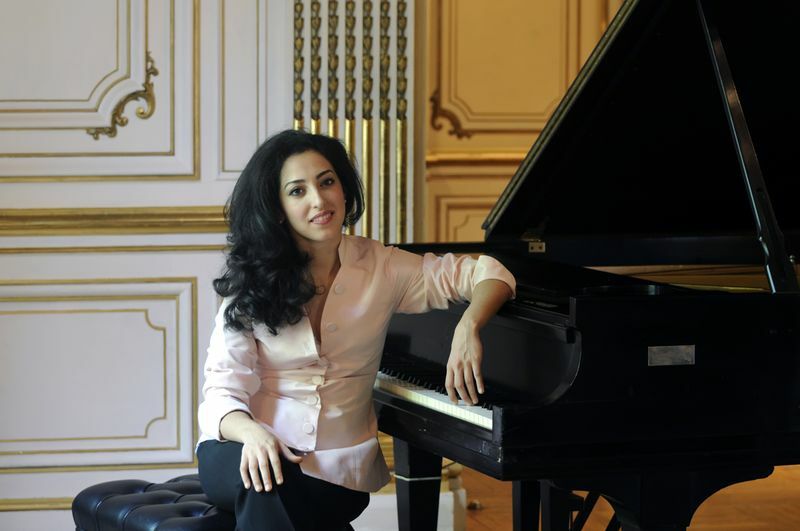 The Simon Sinfonietta’s 2011-2012 season will culminate on Saturday, June 2 with featured soloist Sara Daneshpour performing Mozart’s D minor Piano Concerto No. 20, K466. Music Director and Conductor Stephen Simon has paired this concerto with two additional works to complete the Sinfonietta’s season of adventure: Stravinsky’s Symphony in C and Schumann’s Symphony No. 1 in B-flat major, The Spring. The concert will be performed at Falmouth Academy in Falmouth, MA, at 7:30 pm. Photograph at left by Stephanie Lane. orchestration and complex interrelationships between solo performer and orchestra— as a distinctive turning point toward the modern concerto. In the masterpiece Mozart moves boldly beyond the formal strictures of the day to express individuality. He speaks freely with “the language of the heart” and, through the concerto’s stormy passages, he anticipates Romanticism and the winds of change that were to sweep the world. In this painting by Canaletto, we can see Vienna’s Haus zur Mehlgrube pictured on the right side of the street. This is the location of Concerto No. 20’s premiere with Mozart himself as soloist. for America in 1939 at the outbreak of World War II. He carried with him the first two movements of Symphony in C and completed the third movement in Cambridge, MA, during a lecture stop at Harvard University before moving on to Hollywood where he resided for many years. While Stravinsky’s life journey took him from Czarist Russia to Southern California, the range of his musical brilliance— from 19th-century musical nationalism to 20th-century 12-tone serialism—is no less staggering. In its objectivity and emotional detachment, Symphony in C is an excellent example of Stravinsky’s neoclassical period, where he rejects Romanticism and looks for inspiration in the classicism of the 18th century. Stravinsky is pictured at left in a drawing by Picasso. The program will conclude with a delightful composition by one of the purest of Romantics, Robert Schumann (1810-1856). Composed in 1841 at the dawn of his long-sought marriage with the young musical sensation Clara Wieck, Symphony No. 1 in B-flat major, Op. 38, Spring, is full of youthful intensity and personal lyricism. Trained as a lawyer, working initially as a music critic, and lacking any obvious genius for performance, Schumann did not achieve international status in his day and he has been both championed and overlooked since that time. What is not disputed is that Schumann’s music expresses emotion with unfettered creativity in a manner that transcends his historical period. In Schumann’s own words, the mission of his music was to “shed light on the depths of the human heart.” The symphony’s premiere took place under the baton of Felix Mendelssohn on March 31, 1841 in Leipzig. With this concert program, Maestro Stephen Simon continues to build the Simon Sinfonietta as a point of regional pride and growing nationwide recognition. Tickets are $40/person ($10/student). Patrons: $135 (2 tickets for one concert with name in program; $55 is tax deductible). Tickets are available by phone (508.457.9696), online at (http://www.simonsinfonietta.org), or by mail (check to “Simon Sinfonietta at FA” and mailed to Falmouth Academy, 7 Highfield Drive, Falmouth, MA 02540). MasterCard and Visa are accepted for online and phone purchases. The Simon Sinfonietta is a chamber orchestra of approximately 40 professional members founded in 2004 by Stephen Simon, the internationally recognized conductor who directed the Kennedy Center’s Washington (D.C.) Chamber Symphony for 26 years. The Sinfonietta includes many of the finest professional musicians within the Providence-Boston-Cape Cod triangle. Proceeds from the Sinfonietta’s performances benefit Falmouth Academy, Historic Highfield, and the Cape and Islands NPR® Station WCAI. Pictured at left are Maestro Stephen Simon, Bonnie Ward Simon, and Mark Miller, clarinet soloist in the Simon Sinfonietta’s March 31 concert.